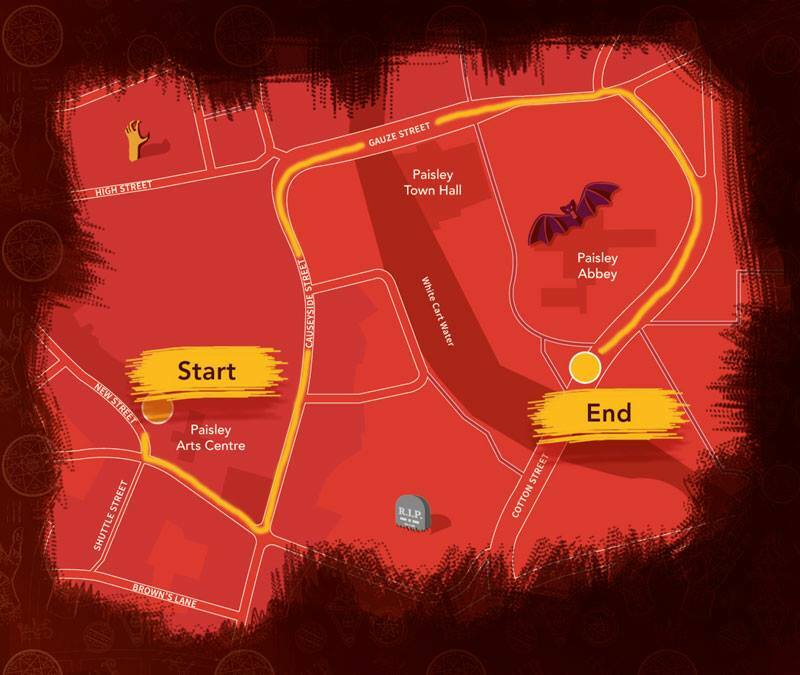 HALLOWEEN PARADE THIS SAT – NEW ROUTE FOR 2017! Our spectacular Halloween Parade is always a festival highlight! With a Fire Monster on a Paisley Chariot, the Spark! Drummers, LED lanterns, Mr Wilson’s Second Liners Band and lots more colourful participants, this is one not to be missed. https://i1.wp.com/www.paisley.org.uk/wp-content/uploads/2017/10/map.jpg?fit=800%2C675&ssl=1 675 800 Brian McGuire https://www.paisley.org.uk/wp-content/uploads/2015/09/paisley-logo-trans.png Brian McGuire2017-10-27 18:45:362017-10-27 18:45:36HALLOWEEN PARADE THIS SAT - NEW ROUTE FOR 2017! Paisley’s musical megastar Paolo Nutini has thrown his weight behind his home town’s bid to be named UK City of Culture 2021. The singer today declared his support during a surprise video message broadcast to a delighted crowd of 30,000 at the town’s Christmas Light Switch-on event, which coincided with the first anniversary of the bid launch. Paolo – who was brought up in Paisley and still has a home there – told the crowd of his pride in the town and why he was backing Paisley’s culture ambitions. He said: “I’m backing the bid because Paisley is and always has been my home. I love the town and want to see it grow. “It’s a town that needs the investment, but it knows what it’s going to do with that investment and I think the potential is really clear. “I see the romance of the town – when you walk into the centre it’s got a beautiful composition. “The bid is about building a structure that can tackle the more deep-rooted problems and it’s important we get behind that. The annual Christmas Lights event included a special Paisley-themed projection on to the side of Paisley’s 850-year-old Abbey asking residents to back the bid. The main stage in the town centre was headlined by triple-platinum-selling popsters Scouting for Girls, who were joined by up-and-coming Paisley bands the Vegan Leather and Dogtooth, as well as kids favourites Funbox. Other activities during the afternoon-long event include a reindeer parade, outdoor snow slope and funfair. The event was organised by Renfrewshire Council and the lights were switched on by Provost Anne Hall, joined by young competition winner Phoebe of Williamsburgh Primary. The bid is being taken forward by a partnership of local organisations, many of whom were showing their support during the day on social media using #WeArePaisley. Residents and visitors alike were also invited to back the bid by pushing a specially-created button on the paisley2021.co.uk website. The Renfrewshire town is bidding for the national title as part of wider plans to use its unique cultural heritage and thriving contemporary creative scene to create long-lasting economic, social and cultural change. Councillor Mark Macmillan, Renfrewshire Council Leader and chair of the Paisley 2021 Partnership Board, said: “Today’s event was all about people of the town having the chance to say We Are Paisley. “So we are delighted that Paolo – as one of the town’s best-known cultural figures – was able to tell the crowd in his own words why he is backing the bid. “The Christmas Lights Switch-on always brings tens of thousands of people into the town anyway, and given the anniversary fell on the same weekend there was no better chance for a mass show of support for Paisley 2021. “The UK City of Culture title goes to a town which can show the UK Government judges that it has a plan to use the title to make a real difference to the area and the people who love there. Paisley is gearing up for a double celebration at the weekend – when the first birthday of the town’s bid for UK City of Culture falls as tens of thousands descend for the annual Christmas lights switch-on. The Paisley 2021 bid was officially launched a year ago and will be a key feature throughout a day of free-to-attend festive family fun in the town centre, this year headlined by triple-platinum-selling popsters Scouting for Girls. The Christmas lights are due to be switched on shortly after 6pm – and this year will be immediately preceded by a spectacular Paisley-themed 3D light show projected on to the Gauze St side of Paisley Abbey. The not-to-be-missed projections will show off the past year’s activity on the bid, while asking residents and visitors to back Paisley’s ambitions before the bid is lodged next spring. The Christmas extravaganza gets under way at noon with the annual reindeer parade, featuring Santa himself and sponsored by the Paisley Centre. The parade will last around an hour and follows a new route, starting and finishing on the High Street and covering St Mirren Street, Orchard Street and Abbey Close. Capital FM DJs including Des Clarke will then get the party started on the main stage in Gauze Street from 1pm. Other activities include a snow beach and toboggan slide in Dunn Square, craft market and Accord Hospice tea room in Paisley Town Hall and funfair in County Square. The cost of the performers is being partly met by sponsors intu Braehead, the Paisley Centre, Invest in Renfrewshire, Renfrewshire Leisure and Renfrewshire Chamber of Commerce. The event is organised by Renfrewshire Council, and council leader Mark Macmillan said: “The Paisley Christmas Lights Switch-on always attracts a massive crowd into the town centre – but the Paisley 2021 element will make this one extra special. “With that in mind, it is great to see two local acts who are making a name for themselves get to play before thousands on the main stage – the area has a thriving grassroots musical scene and we want to show that off. “And the Paisley-themed 3D light show on the side of the Abbey will be a perfect way to round off the first year of the bid. “UK City of Culture tends to go to a place which can show it needs and wants the bid and has clear plan to use the title to transform its fortunes – which Paisley does. Residents and visitors should be aware there will be road closures throughout the town centre on Saturday which will impact on bus routes. See www.mcgillsbuses.co.uk for more info. Parking is free in all council-metered bays and car parks every weekend and there will also be free event parking at West College Scotland, Castlehead High and Paisley Grammar. Thousands of revellers saw Paisley’s historic skyline bathed in colour as the annual fireworks extravaganza returned on Saturday. Almost 30,000 people descended on the town centre for the annual Fireworks Spectacular- hosted by Renfrewshire Council- as part of an afternoon full of family fun and activities. The magnificent Paisley Abbey provided a stunning backdrop as crowds filled the streets around Abbey Close to get the best view of the outstanding display. The fireworks were launched from the roof of the council building on Cotton Street and came at the end of a packed day of entertainment in the town centre. Hosted by the Captial FM DJs, the stage in Abbey Close featured a variety of local bands including The Turkey Nuts, Start, Kong and The Vanities. Also putting on a performance were musicians Sam Holloway, Lisa Kowalski, Rachelle and Brittany Davies and Andrew Quinn- while Gerry Lyons kept the crowd entertained with a 60s and 70s DJ set specially mixed and choreographed for the fireworks display. During the afternoon, families and kids enjoyed free activities Paisley Town Hall as part of an exciting programme of entertainment. Paisley Fireworks Spectacular is part of the push towards Paisley’s bid for UK City of Culture 2021 and is one of many events in an exciting winter events programme, with the Paisley Christmas Lights following on Saturday 12 November- headlined this year by triple-platinum selling band Scouting for Girls. Renfrewshire Council Leader Mark Macmillan said: “It’s fantastic to see so many people coming into Paisley town centre for one of the flagship events of our winter programme. “We’re working hard to regenerate Paisley and events such as this bring fantastic footfall into the area and give a boost to the local economy. The fireworks event was sponsored by the Paisley Centre, Intu Braehead, Renfrewshire Leisure and Invest in Renfrewshire. For more information on future Renfrewshire events, visit www.renfrewshire.gov.uk/events. Residents are being urged to stay safe this bonfire night and recognise the danger fireworks can pose if handled incorrectly. Attending a public display is the safest way to enjoy the celebrations but if people are planning their own fireworks it is important that advice is sought to prevent accidents. If you are having a private fireworks display, residents are urged to be considerate of their neighbours by informing them in advance so they can be prepared. Fireworks should be used one at a time and should be pointed in the opposite direction to any spectators. It is also important not to return to a firework once it has been lit, even if it appears to have gone out. Sparklers may seem harmless but they can get five times hotter than cooking oil and should only be used at arm’s length and with gloves- especially in the vicinity or children. If a burn occurs then it should be run under cold water for at least 10 minutes to completely cool the skin which will prevent pain, scarring or further damage. Once cooled, cover the burn with cling film or a plastic bag. It is also important to recognise the distress that fireworks can cause pets during this period and precautions should be put in place to make them as comfortable as possible. Councillor Tommy Williams, Convener of Renfrewshire Council’s Housing and Community Safety Policy Board, said: “Safety is paramount when it comes to fireworks so it is important people know how to handle them correctly to prevent injury. “Attending a public event, such as Paisley’s fireworks display, is the safest way to have an enjoyable night without any risk and we would encourage people to consider this before having their own. Paisley will host a fireworks event in the town centre on Saturday 5 November, with family entertainment from 2pm in the run up to the display which takes place at 7pm. Paisley Rugby Football Club are having their annual Fireworks display at Anchor once again on Saturday 5th November 2016 from 8pm until 11pm. Burgers, Hotdogs, Tea & Coffee will be on sale at an affordable price and Clubhouse bar will be on sale at an affordable price and Clubhouse bar will be open. It’s a great night and all monies made go towards re development of the Club. The Paisley skyline will be awash with colour this Saturday as the annual fireworks display returns with a bang. Thousands will descend on the town centre for a full day of family activities as the winter events programme in Renfrewshire continues. The excitement kicks-off at 2pm when the Capital FM DJs take to the main stage on Gauze Street to introduce an afternoon of music and live entertainment. A variety of local bands and artists will showcase their talents including Matthew Gibb, Lisa Kowalski, The Turkey Nuts and The Vanities. The Paisley and Piazza shopping centres will also play host to free children’s activities throughout the afternoon. The fireworks will be launched at 7pm from the top of Renfrewshire Council’s headquarters on Cotton Street, with the best views for the public set to be in Abbey Close and Gauze Street. Renfrewshire Council Leader Mark Macmillan said: “Every year the fireworks display attracts tens of thousands of people into Paisley as we light up the historic skyline. “There is always a vibrant atmosphere around the town and I would encourage everyone, from families to visitors, to join in the experience of a major event in the town centre. The fireworks display follows last weekend’s two day ‘spooktacular’ held in Paisley town centre to celebrate Halloween and precedes the switching on of the Christmas lights in Paisley, Johnstone and Renfrew. The Paisley switch on will be headlined this year on Saturday 12 November by triple-platinum selling artists Scouting for Girls, known for their top 10 singles ‘She’s So Lovely’ and ‘It’s Not About You’. They will be supported by up-and-coming local bands on the main stage. Paisley Fireworks Spectacular is sponsored by intu Braehead and the Paisley Shopping Centre. For more information on Paisley’s bid and how you can get behind it, visit www.Paisley2021.co.uk. Gavin Newlands, MP for Paisley and Renfrewshire North, attended an awareness event in Parliament on Tuesday to highlight the potential fire risks of children’s fancy dress costumes. Currently, the law classes fancy dress costumes as toys rather than clothes meaning that they undergo far less rigorous safety tests. But Sainsbury’s, and other leading supermarkets have introduced more stringent testing following a campaign by the host of BBC’s Strictly Come Dancing, Claudia Winkleman, whose daughter, eight-year-old Mathilda, was seriously burned wearing a witches’ outfit while trick or treating. “I’m delighted that last year funding was made available for Trading Standards to conduct spot checks on hundreds of retailers to ensure that costumes meet safety standards. I also applaud Sainsbury’s and other supermarkets for introducing more stringent safety checks and would now call on others to follow suit. Paisley is gearing up for a spooky entertainment extravaganza at the weekend when the annual Halloween festival once again takes over the town centre. The hugely popular annual event – run by Renfrewshire Council – is one of only a few of its kind in Scotland and will take place over Friday evening and all-day Saturday. The first day of fun runs from 6 to 9pm on Friday, starting with a lantern-lit parade down the High Street from the UWS main entrance to Abbey Close, led by the stunning Spark! LED drummers. Abbey Close itself will be home to a fire garden run by outdoor arts specialists Walk the Plank, featuring fire-breathing sculptures, illuminations and much more. Paisley Town Hall will be Spook Central, with Halloween arts and crafts, family disco, storytelling, puppet shows and music sessions with Feis Phaislig. Saturday will see more of the same from 12 until 9pm, but with the addition of a main stage featuring live music from local musicians and dance groups and entertainment from Pulse FM DJs. Both days will also have a funfair, street entertainers and a great selection of outdoor food vendors. This will be the third year of the Halloween Festival and kicks off Renfrewshire’s major winter events programme, with the Paisley Fireworks display (Sat 5 Nov) and Christmas Lights Switch-on (Sat 12 Nov) set to follow. And this year will see a special treat with the world premiere of a new performance by award-winning visual theatre artist Al Seed taking place in Paisley Town Hall’s Loggia room. The show is one of the first to be funded by Renfrewshire’s Culture, Heritage and Events fund, which aims to boost cultural capacity in the run-up to Paisley’s bid for UK City of Culture 2021. Renfrewshire Council Leader Mark Macmillan said: “We are delighted to be welcoming the Paisley Halloween Festival back for another year – it has been a hugely popular family day out with locals and visitors alike since it started in 2014. “Again, we expect thousands of people to descend on Paisley town centre over the two days, providing an economic boost to the local area and local traders. “This year’s winter events are extra special as the last ones to take place before the town’s bid for UK City of Culture 2021 goes in next year. “And with that in mind, we are delighted to welcome critically-acclaimed performer Al Seed to the town for a unique performance made possible by the Paisley 2021 bid. “But the event is also a great showcase of the talents of the thriving grassroots creative scene we have here in the town. The groups taking part in the weekend include Independent State of Happiness, Right To Dance, Street Stuff, Floor4orce, Solid Rock Cheerleaders and Rock Us Community Choir.